Canelo and Josesito serious face off. In an entertaining presscon in Ciudad de México, reigning WBC Jr. Middleweight (154 lbs) champion Mexican Saúl "Canelo" Álvarez (left) and popular new star WBC Silver Welterweight king Josesito López faced off during the second leg of their promotional tour for their much awaited Jr. Middleweight title match at the famed MGM Grand Arena in Las Vegas on September 15 to celebrate Mexico's Independence Day. A super lightweight fighter of Mexican parents, the 28 year-old Josesito Lopez has become a new sensation after his thrilling victory over the much hyped and bigger Victor 'Vicious' Ortiz last month at the Staples Center in Los Angeles. Josesito, weighting only 144 lbs destroyed Ortiz in what has come to be one of the biggest upsets of the year; and now the California boy will climb to the Jr. Middleweights to challenge the undefeated raging bull champion Saul "Canelo" Álvarez. The WBC president Dr. Jose Sulaimán was the guest of honor at the event attended by a large number reporters and members of the media. 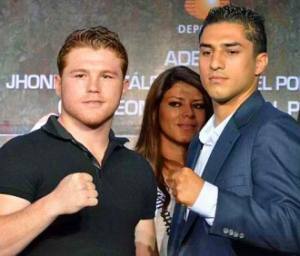 The Canelo-Josesito "Knockouts Kings" card promoted by Oscar de la Hoya's Golden Boy Promotions will be up against the also thrilling Top Rank's Chavez-Martinez Middleweight Title fight to be staged on the same evening at the Thomas & Mack Center in Las Vegas.